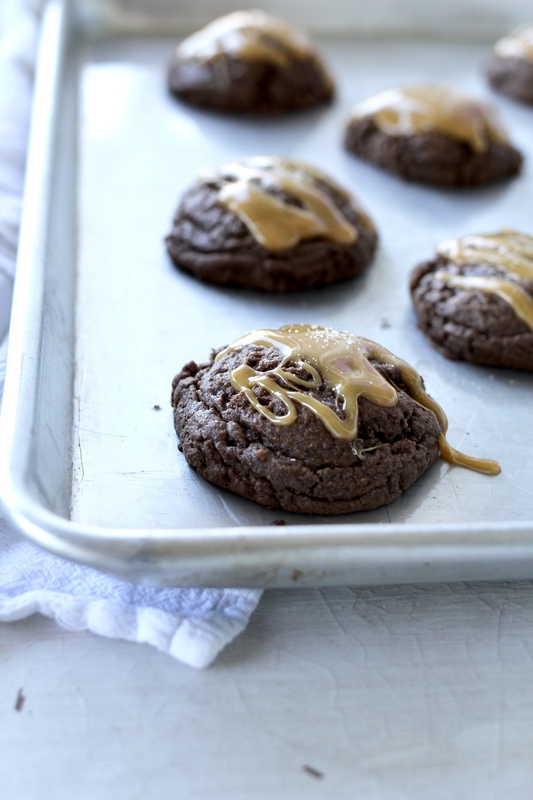 Salted Caramel Brownie Cookies are the ultimate brownie and cookie lover’s treat! A chocolatey, chewy, brownie-cookie, baked to perfection, topped with a bit of caramel, and sprinkled with just little sea salt. I’m a big fan of brownies and cookies. If I had to choose between the two, I think brownies would be #1, with cookies following as a close second. I like my brownies chewy, with lots of chocolate flavor. One of my all time favorite treats is a caramel brownie. What’s not to love about a brownie topped with a layer of sticky caramel?? The only thing I don’t love about caramel brownies is trying to cut them. 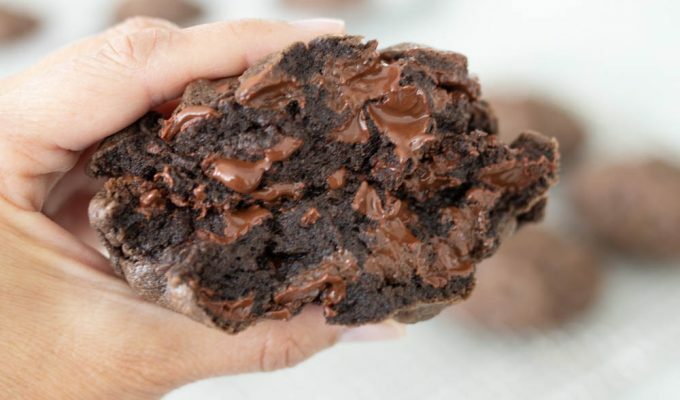 This recipe takes the hassle of cutting sticky brownies away by forming the treat into a cookie. 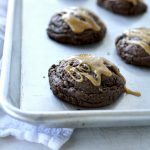 I combined a few of my favorite brownie and cookie recipes to come up with this Salted Caramel Brownie Cookie. It’s the perfect marriage of a chewy, moist brownie and a cookie. To shape the cookie, I like to use a cookie scoop. The cookie scoop is the perfect way to get dough to appear to be uniform with a nice round shape. Remember, if you bake the cookie and it isn’t shaped exactly the way you’d like, you can quickly push the edges of the cookie in to reshape while it is still hot. I use this trick all of the time to get a nicely shaped cookie! It is best to let this cookie set up for at least an hour ( two is even better) before serving. The caramel is fairly soft and takes a while to firm up after cooking. 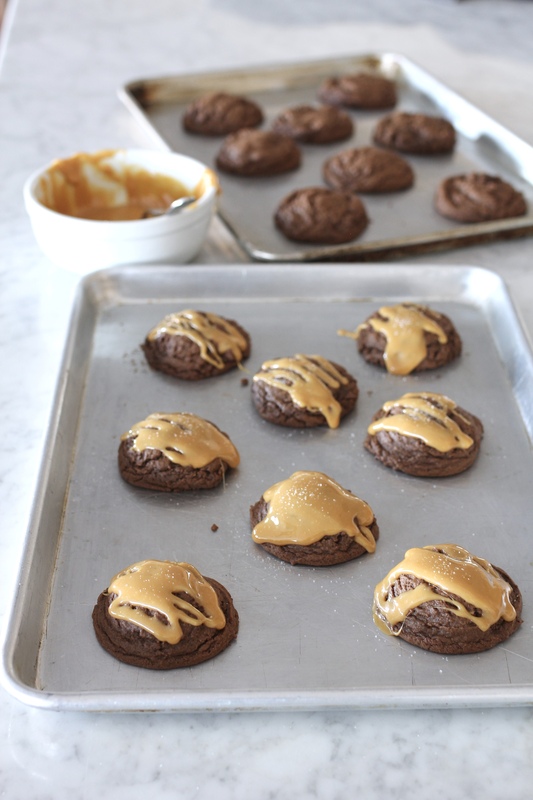 There are two ways to top Salted Caramel Brownie Cookies. I wanted to post a recipe that would be simple for everyone to make, so I used Kraft Caramels mixed with a bit of milk to get the caramel to spread easily. Kraft Caramels are found everywhere, usually in the candy aisle. I used the light variety, but you may also use the darker caramels if you prefer. My go-to source of caramel for the past few years is Peters Caramel. It is sold in Salt Lake City at Orson Gygi. If you don’t live in SLC, you can order it online here. I love Peter’s Caramel because it is so easy to use and keeps in your pantry forever. I just slice off a small bit, spread it with my fingers and then lay on top of the hot cookie. No need to place it back in the oven of you place the caramel on while the cookie is warm. So simple! Most of you know from following along on Instagram, that we just returned from an epic trip to Israel. I hope to post about it soon. It was wonderful in every way. Except one. Quality treats. I was craving a good cookie the entire time I was out of town. I couldn’t find one that satisfied my chocolate craving! Note to me. Next time we travel to the Middle East, take cookies! There were lots of fun new treats to try, but nothing like a chewy cookie, especially one like this Salted Caramel Brownie Cookie. I may or may not have eaten two or three or four when we returned! Pre heat oven to 375 convection or 400 degrees regular bake and set rack in center of oven. Melt 4 oz unsweetened chocolate in microwave in a small bowl for 30 seconds, Continue to melt in 15 second intervals until smooth, set aside. Place the butter and sugars into the bowl of a stand mixer or a large bowl. Beat butter and sugars on medium speed until smooth. Add eggs. Beat on low until butter, sugar and eggs are incorporated, scraping bottom of bowl once or twice to insure all ingredients are mixed together. Add melted chocolate, and beat on low until smooth, again, scrape bottom of bowl once or twice. Add flour, baking soda and salt all at once. Mix on low or pulse mixer until all flour disappears and all ingredients are incorporated. Using two lightly greased baking sheets, scoop out dough onto baking sheets, 8 scoops to a sheet. I use a 2 1/4 inch cookie scoop. Lightly press the center of the cookie with palm of hand. Bake cookies for 7-8 minutes or until top is barely set and is no longer wet. Remove from oven and re-shape the cookies with a small spatula if the cookies spread during baking. This needs to be done while cookies are still hot out of the oven. Let cookies cool on baking sheet. Unwrap about 1/2 of an 11 oz package of Kraft Caramels and place caramels in a microwave safe bowl. Melt for 45 seconds in microwave, remove and stir. Continue to melt caramel at 15 second intervals, until caramel is melted and easy to stir with a spoon. 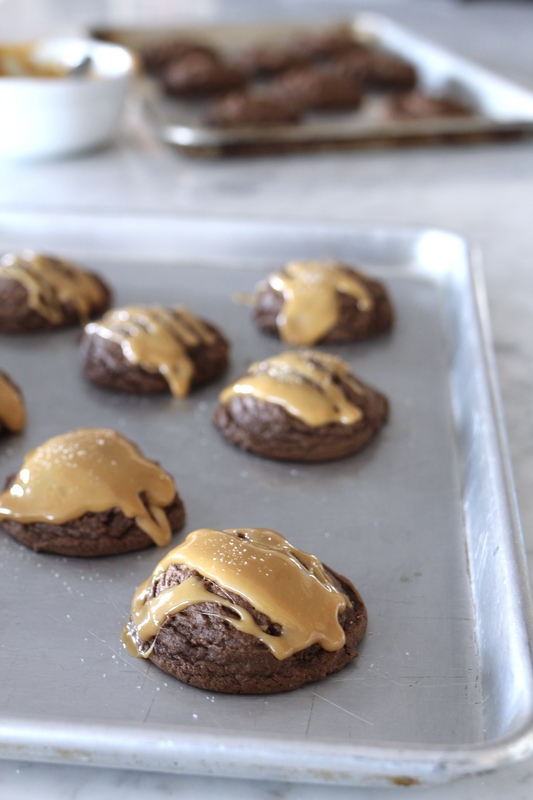 Add 1 tablespoons of milk and stir into caramel until the caramel is smooth and easy to scoop with a spoon and drizzle onto cookies. 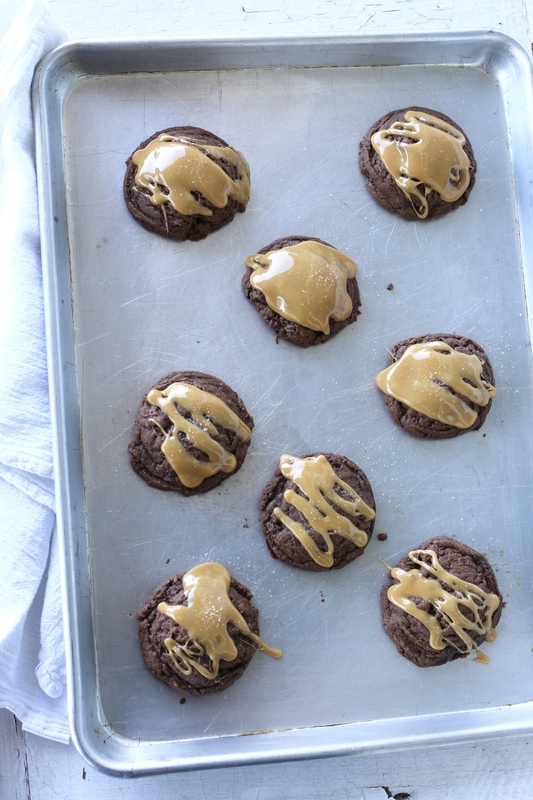 Drizzle caramel onto cookies and immediately sprinkle with a bit of sea salt. Let cool completely before serving or placing on a serving platter. I’m making these RIGHT now- sending Clara to Target on her bike to pick up the caramels! We have an RS dessert social tonight! Yummy! Thanks Si! Let me know how they turned out! Send me a picture I will add to my Instagram photos. this is probably one of the best brownie recipes i’ve every made. the chocolate with the salted caramel is such a great taste. and super easy to make!!! LOVE IT!! Got rave reviews and thumbs up from the grandkids! It’s always an honor to get the “Grandkid’s Seal of Approval”! Thank you for your rave reviews, and thank you for reading ABK! I made these for the first time last night to pass out to friends and neighbors for Christmas gifts. They were a huge hit and everyone has loved them. Thanks for the yummy recipe! I’m so glad they helped spread some Christmas cheer! I just love the sweet and the salty! These looks scrumptious! 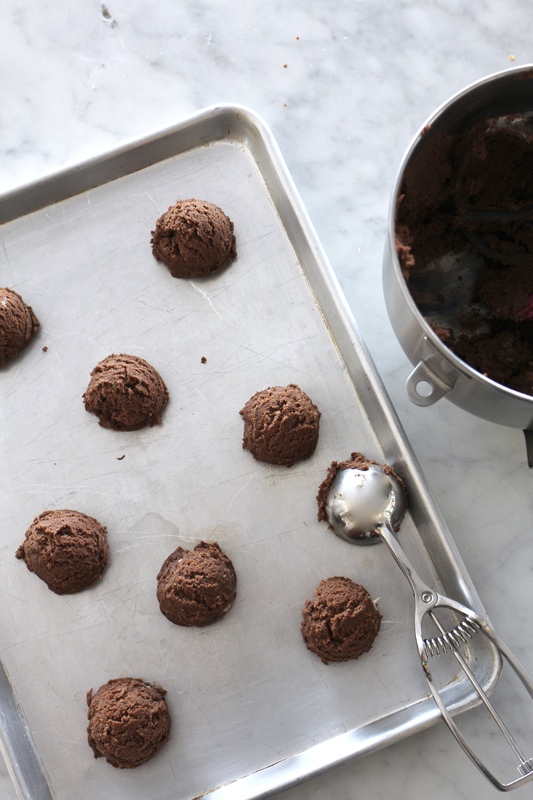 Do you know if you can substitute baking cocoa instead of unsweetened chocolate in this recipe? To replace one ounce of unsweetened chocolate, use 3 tablespoons cocoa powder plus 1 tablespoon butter, shortening or oil. Dissolve the cocoa in liquid that is already used in the recipe. Hope this works for you. Let me know how you like this recipe. I love the combo of brownie and cookie too. And what a perfect treat to share with the neighbors! Thanks for sharing, Dianna.